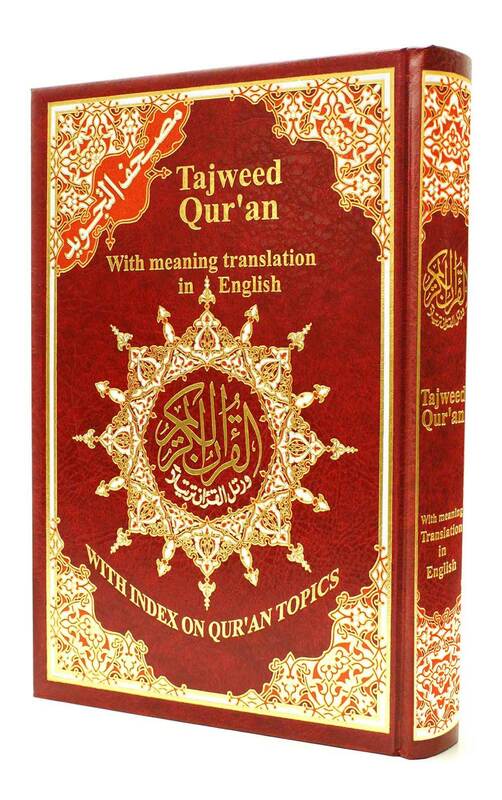 This complete Colour Coded Tajweed Quran comes with a nice and beautiful hard cover, it includes Translations into English. The letters which requires expanded vocalization: we used red color to highlight these letters. The letters which is nasalized: these letters are green in color. The dark blue color indicates the emphatic of the letter (R), the blue color indicates the unrest letters- echoing sound- (qualquala), while the letters which are written but are not pronounced are gray in color. It is an honor for Dar Al-Maarifa to adopt and offer this methodology which has been accurately applied after examining the passages written at the end of it, and which was examined and accredited by the Committee of The Noble Quran. For more info please click here). I received the two Qur'ans (one with the transliteration and one without the transliteration) that I ordered, and I'm very satisfied. The Qur'ans are beautiful and are of high quality. Shipping and delivery was super fast, and packaging was done with care. Thank you so much!